For any readers that I have on this blog, I'm sorry to say that I won't be writing any more on Blogger. However, I will be writing in my WordPress blog from now on, and eventually Ben Linton and I will merge together on WordPress to cover our favorite teams in the Baltimore and Washington area, music, and anything else important. I will cover the Ravens, Wizards, Rap/Hip-Hop, and D.C. United/USA Soccer. Ben will cover the Redskins, Orioles, and Rock. We will both cover anything we feel is important to the sports world or anything we find interesting, Terps' Football and Basketball, and the Washington Capitals. Once the merge is complete, I'll post the link on my WordPress blog. Thanks for reading and I hope you continue. According to Dictionary.com, "Retire" means "to withdraw from office, business, or active life, usually because of age". As seen over the past few years, Brett Favre does not know what this means. After coming out of retirement last year to play for the New York Jets, Favre retired after missing the playoffs. I think more people believed he would stay retired this year, but, according to multiple news sources, this is not the case. Favre had surgery on his shoulder to repair his injury, and is frequently visited by Vikings' trainers. He is also back working out at his local high school. When asked about coming back, Favre said, "Um...maybe". WOW!! It looks like Brett Favre will be returning to the NFL to play for a team that he once hated. Although Tavaris Jackson played less games, he managed to be more accurate than Brett. Don't forget though, that Brett Favre did suffer a shoulder injury in his throwing arm, causing less accuracy and less power. Even though I believe that Favre is the better Quarterback, I don't think he will be a huge improvement. With this being said, I think Favre should stay retired. Packer fans are already upset with him for returning with the Jets, despite the fact that the Packers' GM did not want Brett back, and if he signed with their second biggest rival, I don't see how he will be able to step back in the Green Bay limits when he truly is retired. His image is already tarnished and fans are sick of hearing about all his news. My question is, "Why make it worse Brett?!" I know he has a very strong passion for the game, as do I for any sport I play, but do you really want to go from the most popular icon in that city since Vince Lombardi, to a hated icon? It's all up to you Brett, but know there are consequences for your actions. Once the schedule came out, I, as well as many other Ravens fans, became very optimistic about the upcoming season. The team got a break from having one of the hardest schedules, to having one of the easiest. The two conferences, out of the AFC North, that the team will square off against are the NFC North and AFC West, two lackluster conferences that have most of the teams in a rebuilding mode. The first four games of the season have two home games and two away games. Game one is at home against the Chiefs, game two is at San Diego, game three is at home against the Browns, and game four is in New England. The second quarter of the schedule is formatted the same way; vs. Bengals, at Vikings, vs. Broncos, at Bengals, with a Bye Week during week seven. The next four games appear to be the toughest part of the season for the Ravens. A Monday night game in Cleveland followed by a home game against the Colts and then a Sunday night game at home against Pittsburgh, and ending with a Monday night game in Green Bay. The last four games might be the easiest, with two home games against the Lions and Bears, and ending the season on the road in Pittsburgh and finally in Oakland. After these 16 regular season games, the team will look to make more noise than last year in the playoffs. The biggest tasks for the Ravens this year will be defeating the Steelers (swept last year 3 games to none), Flacco avoiding a "sophomore slump", and the defense staying up to the greatness that Rex Ryan established over his tenure. There is a lot of anticipation and optimism in and around the Baltimore Ravens' organization, and it's clear to see why. As the week goes on, more sports updates will be posted. Can We Call Kobe Superman's Krpytonite Too? As most know by now, Kobe Bryant and the Los Angeles Lakers pulled off the series win against the Orlando Magic in the NBA Finals 4 games to 1. In my previous post about the finals, I predicted that the Magic's 3-point shooting and Dwight Howard would lead the team to 3 wins and a 7 game series. Clearly, this was not the case. 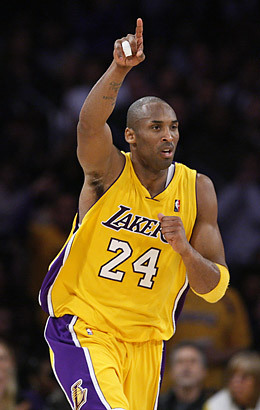 The Laker big men, Pau Gasol and Andrew Bynum, were very effective, as was Lamar Odom off the bench. Odom was a threat inside and his 3-point shot became a dagger to the Magic defense. Trevor Ariza had very impressive numbers, and Kobe was Kobe, putting on a show and making incredible shots. I guess it really is true that when you guard Kobe, if you have your hand down, you're a man down. For the Magic, their shots just did not fall consistently, from game to game or even half to half. Dwight Howard was the best defender on the floor, however he was extremely limited offensively, either being in foul trouble or missing many shots. He also shot poorly from the free throw line. Jameer Nelson, the Magic's All-Star point guard who was injured the second half of the season with a shoulder injury, returned to the line-up. After having an effective game one, he appeared to disrupt the team chemistry, and probably should have played less since Rafer Alston was "skipping to his lue" most of the series. All this consequently resulted in the Lakers winning their franchise 15th NBA Championship, two behind the Celtics. Kobe got his fourth title and first Final's MVP, and Phil Jackson won his 10th NBA Title. As for Kobe, I feel somewhat happy he won, because he is too great of a player to be downplayed by winning his first three championships with Shaq. Kobe needed Shaq, Shaq needed Kobe. Magic needed Kareem, and Kareem needed Magic. Jordan needed Pippen, and vice-versa. The bottom line is, the team in general need each other. With this championship, Phil Jackson can be called the greatest NBA coach ever. He has 10 championships, 209 playoff wins, the most by any coach, and a 71% career winning percent. I cannot see how anybody could say that he is not, unless you're a Celtic/Red Auerbach fan. On the eve of the NBA Finals, I found it appropriate to break things down as of now. The Orlando Magic, who have just recently denied LeBron James from winning a championship, keeping his count at ZERO, are trying to win their first championship. The Lakers are going for their 15th!! Not only that, but Kobe Bryant is going for his 4th! Now before the Conference Finals began, I predicted the NBA Finals would consist of the two underdogs, the Magic and the Nuggets. Well it seems that I got half of that right. Even though I got that wrong, this matchup is still very intriguing to me, and should be to all the LeBron bandwagoners and the Nuggets fans. Both of these teams have great perimeter games. The Magic have Rashard Lewis, a very under-rated player, and Hedo Turkoglu. On the opposing side, the Lakers have Ariza, Kobe of course, and Sasha Vujacic. When it comes to the inside games, the Lakers clearly have the edge in this one. Pau Gasol is a force who can hit crazy shots, and Odom looked impressive the last two games, we just have to see if he can keep that up. Andrew Bynum can be a force, but still has not had a breakout game yet in the playoffs. The Magic have Dwight Howard mostly, but Tony Battie has some good games. If that's not a mismatch, what is?? The defenses look pretty similar to me, just from watching both teams in the playoffs. With all that being said, I believe the Lakers will win in 7. Their inside game presents too much of a trouble to me, but the Magic will most certainly not go down easy. Expect a great series. People call me J Jones or Jones! I play sports: soccer, and basketball. I'm jammin to music all the time, rap/r&b.